Road race bikes are purpose built racing machines. They are ideal for competitive riders, and those looking to ride at peak power and efficiency. They sport aggressive geometry which maximizes power output and handles extremely quickly. We carry the Trek Emonda, Scott CR1, and BMC Team Machine. For women's specific models, we carry the Trek Emonda and Liv Avail. Endurance road bikes were designed for road cyclists who value stability and all day comfort over being the fastest. These frames have had a small amount of vertical compliance engineered into them to reduce road vibration and take the edge off of bumpy roads. These bikes often sport wider 25-28c tires to help even more. We carry the Trek Domane, BMC Gran Fondo, and Scott Solace. For women's specific models, we carry the Trek Silque. Vermont has miles of dirt roads, and what better way to explore them than by bike? We have the perfect bikes to match, whether you're into the performance of a cyclocross bike or the all day appeal of a gravel grinder. Cyclocross bikes offer race ready geometry and performance, while gravel road bikes are more casual and lend themselves to all day adventures. Gravel bikes also make for great commuter bikes because they work well year round, rain or shine due to their higher volume tires and disc brakes. We carry the Trek Crossrip, Trek Crocket, Giant Anyroad, and Scott Addict CX. For women's specific models, we carry the Liv Invite and Liv Invite CoMax. Touring bikes are purpose built for extremely long distance and multi-day rides. They have relaxed geometry and wider tires like endurance road bikes, but have significant differences as well. The components, such as friction shifters, are chosen for their ease of adjustment and reliability. The frames are also reinforced and equipped with racks to carry anything you may need on a long journey. 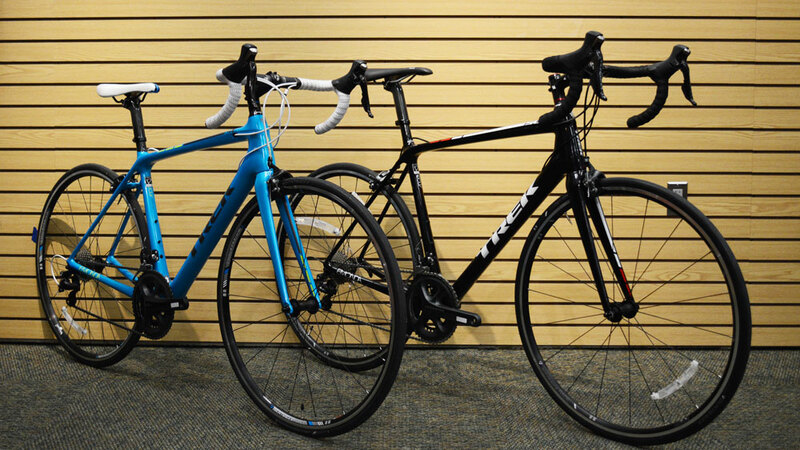 We carry the Trek 520 and Trek 920.